Recommended for those looking to do something other than a Red Arrow Hawk. St Athan was an RAF maintenance base for jet bomber and fighter aircraft of which the BAe Hawk was one such aircraft that was maintained at the base. RAF St Athan crews have also been responsible for the major servicing of the Battle of Britain Memorial Flight's Avro Lancaster bomber. Euro Decals produce decals that cover a diverse range of subjects, from WWII Axis and Allied aircraft, through Cold War bombers to more recent aircraft and operations. This release however covers one RAF Hawk TMk1A, XX172, over two periods. 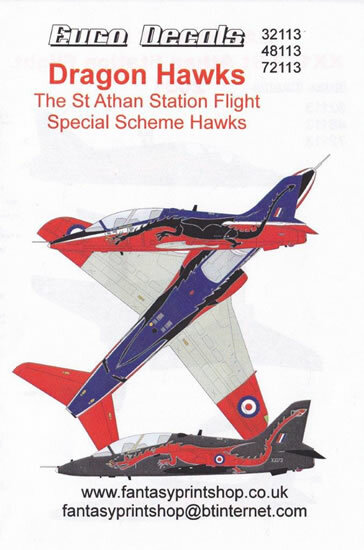 This Hawk from RAF St Athan in 1995 wore a Red/Blue and grey scheme that was emblazoned with a large black dragon on each side (as per the base crest). 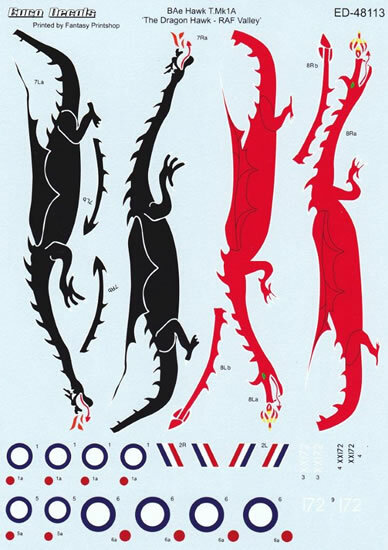 The second era was in 2001, when XX172 was painted gloss black, the dragon was repainted in red in a similar design to 1995. The instructions provide a 4 view layout with BS paint callouts. The decals cover the specific markings with no additional aircraft stencils. The decals themselves are produced by Fantasy Printshop and look to be thin with minimal carrier film. The Roundels are provided with the red as an extra decal so no issues with registration. There is no mention about recommended decal setting solution so take care as the dragon will cover the numerous curves on the fuselage. These are very striking markings and will definitely look great on your Hawk. 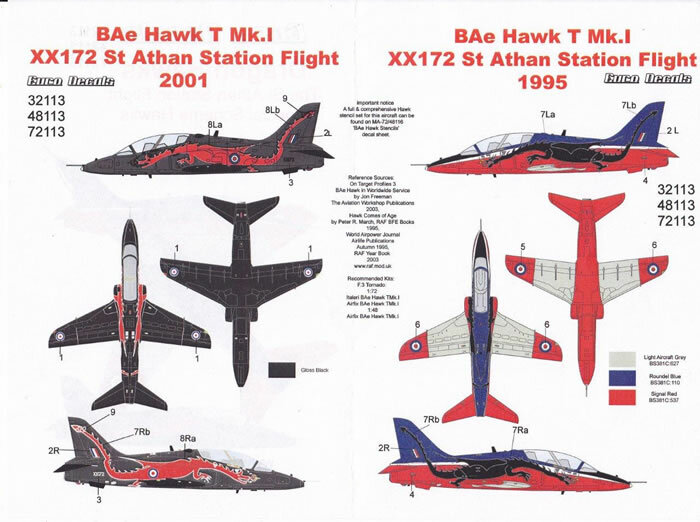 Given that they cater for 1/72 up to 1/32 these should appeal to all BAe Hawk fans.